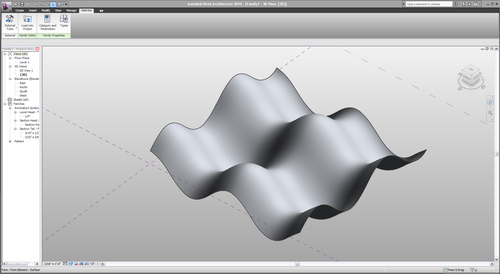 This is a sample code for making parametric surfaces in the Revit API. list item There are only about 4 ways to create a surface (Loft, extrude, sweep, revolve)… A surface from a point cloud or from 4-points would be very handy, Autodesk! list item Revit doesn't seem to "like" self-intersecting surfaces very much… and even sometimes mistakes 'closed' shapes or shapes where edges touch for self-intersection….so no Kleins or Catalans, booo!